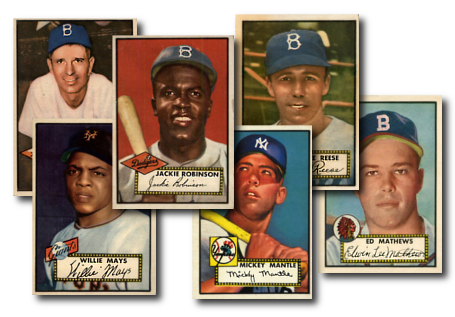 See our available 1952 Topps Cards! The 1952 Topps Reprint Baseball Card Set consists of 402 cards measuring 2½" by 3½". The 1952 Topps baseball cards were reprinted by Topps and feature the phrase "Topps 1952 Reprint Series" on the back of each card. Five players that had cards in the original 1952 Topps set, were not included in the reprint set: #20 Billy Loes, #22 Dom DiMaggio, #159 Saul Rogovin, #196 Sonny Hemus and #289 Tommy Holmes. These cards offer an economic option to the original 1952 Topps high number cards, which can be very expensive to collect.. Showing 1 to 100 of 375 products.